VIERLING Communication SAS the French subsidiary has been created in May 2004, and is located at Trappes, near Paris, France. The company was bought from Telecom Test and Monitoring activities from Thales Idatys. This gives the company a long and reach experience of more than 20 years, including also activities from Dassault AT bought by Thales previously. VIERLING Communication SAS has a large installed base in Europe, Africa, Latin America and Asia. In France, VIERLING Communication SAS is taking over the further development and repair of the MIRABEL test system of France Telecom. With about 15,000 measurement probes, MIRABEL is one of the largest systems for monitoring telephone lines and correcting problems as they occur. guarantee the image of quality of the operator, thus increasing customer satisfaction and brand loyalty. In addition to the qualitiy of copper lines the topic service testing gains more priority. The Maestro system is able to measure important parameters related to availability and service quality. Not only parameters of the DSL line are detected, but also characteristics of an Internet access (e.g. PPPoE, DNS) and quality parameters of VoIP and IPTV. Thus you can reach more service availability and fast troubleshooting. VIERLING plans to upgrade Maestro with an additional service testing functionality. The system will be able to measure parameters such as the data rates in the upstream and downstream and the ATM connection parameters (including VPI/VCI). The system will also support tests of VoIP and video service quality. the Maestro management Software (MMSW) which receives the test requests either from operators, customers' OSS or Field Access Point. the Maestro Test and Diagnostic Unit (MTDU) installed in the Central Office, which performs the line test. 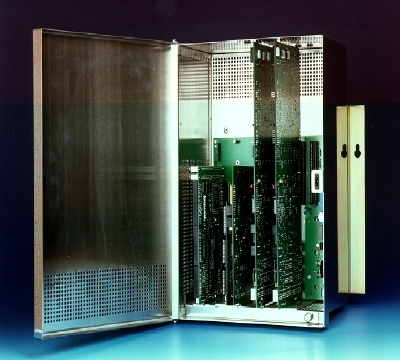 the MAX HD access matrix, where applicable, installed in the central office, which provides access to the line to be tested. Maestro has got the necessary adaptability to support all kinds of networks to be monitored. The number of lines, structure, required performance level, characteristics of the Local Exchanges (manufacturer, hardware, software), are all parameters taken into consideration when Maestro is incorporated into the network. The MTDU is a Test Head that can be adapted to any configuration. It can be connected to a Local Exchange, to a DSLAM (Digital Subscriber Line Access Module), to a matrix (like the MMTA matrix, MAX HD), or to a DLM for leased lines. If operators use Customers' Operational Support Systems (OSS), whether proprietary or a package, Maestro can be easily and quickly combined with them through supplied programming interfaces (API), thus offering a complete and effective application-tailored solution. 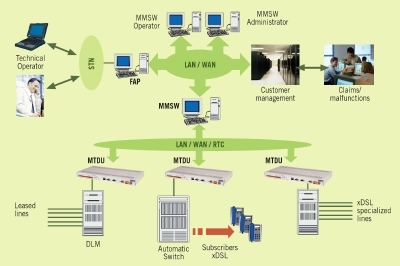 In addition, the MMSW Management Software is built on a Client/Server model. It has the necessary modularity for distributing logic services on various machines (distributed architecture). Its development using Java makes it portable to any platform having a JRE 1.3 engine, in particular Windows 2000, XP and Linux. The optical fibre is undoubtedly the only technology that meets the bit-rate requirements of most new services. Bit-rates in the range of up to 10 Gbits/s are now rather common and will be shortly overtaken by WDM (Wavelength Division Multiplexing) technologies that will support hundreds of Gbits/s and even more. In case of failure, the disaster is in proportion with the capacity of the broken link. Thousands of users are sometimes suddenly disconnected. The Quality of Service is clearly of paramount importance. Pro-active maintenance is therefore essential. The optical fibres must be permanently monitored in order to detect the defects and anticipate the failures. However failures sometimes occur. The maintenance team must then fix the link urgently. For that they need accurate and reliable data. A precise diagnosis and location of the defect saves precious time and much money. FiberCare is designed to monitor networks, made up of monomode optical fibres, working in point-to-point as well as point-to-multipoint (PON) architecture. The measurement technique is based on the most advanced reflectometry technologies. Every FiberCare unit monitors from 1 to 10 fibres and permanently tests each fibre within a 3-minute period. Thanks to accurate signal processing, any defective section or cut-off is detected in a range from approx. 100 km. The uncertainty in the defect location is approx. 5 m.
FiberCare is primarily used for curative purpose, since the diagnosis and localisation greatly help the field team. However, the role of FiberCare in pro-active maintenance is at least as important. The detection of defective sections, that would cause failures (connector ageing, water penetration, cable curvature, etc.) is the basis for QoS. The optical fibres are statically connected to FiberCare. No optical switch is needed. On the one hand, this ensures higher reliability and, on the other, quickens the process since all the fibres are simultaneously tested. In addition, its great modularity (optical board for 2 fibres) allows flexible configurations and progressive investments. A FiberCare system includes a number of Optical Test and Diagnostic Units (OTDU) and an Optical Main Control Unit (OMCU). This device performs the measurement, and sets the diagnostic accordingly. Fibres are permanently connected to Optical Measurement Boards (up to 5 OMB's per OTDU), each monitoring 1 or 2 fibres at the same time. or remotely from the Optical Main Control Unit, through PSTN or PSDN (X.25 or TCP/IP). This device is in charge of controlling the OTDU's remotely. The OMCU is a PC running under WINDOWS, that permanently displays the status of the network and alerts in case of disruption. Working as a server, the OMCU can also provide several client terminals with the same information. The OTDU works either on spare fibres ("non active fibres") or on active fibres. Even if testing non active fibres is still popular, one should recognise that in this case only fibres which incur no risk are monitored! Working on active fibres is clearly much more efficient. In order to test active fibres, optical components, including a coupling device and optical filters, are inserted into the network. The OTDU works in a waveband different from the operating one, in order not to interfere. Thanks to this new approach the optical fibres that ensure your business are protected!